So, December 17 was my 30th birthday and, of course, it was also Star Wars day! I will confess up front that, although I definitely like the movies and respect their importance in nerd fandom and pop culture, I’ve never been a super huge fan of them. I didn’t see them as a child (tragic I know! ), so I didn’t finally see them until I was 15 (just before Attack of the Clones came out). I’ve always enjoyed them, but I’ve only seen them a handful of times each and haven’t memorized them like certain people I know. 😉 Still, Star Wars day being on my birthday was pretty cool. No spoilers, but I really enjoyed the movie and am looking forward to seeing it again at some point. And of course, when I enjoy something… I have to crochet it. Especially when that something has a super cute character that is essentially two balls on top of each other and thus can be made in just a few hours. So this was my Christmas Eve project, made while hanging out at my parents’ house on Bowen Island – the newest droid in the Star Wars universe, BB-8! I finished him in the evening, and then before I went to bed I started this little guy. I want to make Christmas ornaments to sell at FanExpo Vancouver 2016, which will be in November so the perfect time for some early Christmas shopping. This was super fast, like I made most of him in about 45 minutes around midnight on Christmas Eve, and the rest in another 30 or so minutes on Christmas morning. The orange circles are very quick and rough, and when I make them to sell I’ll be more careful and plan them out before I stitch them on (then they will actually all be circular…). He needs a second eye too, because I had limited craft supplies on Bowen. But anyway, he is cute and I enjoy him! 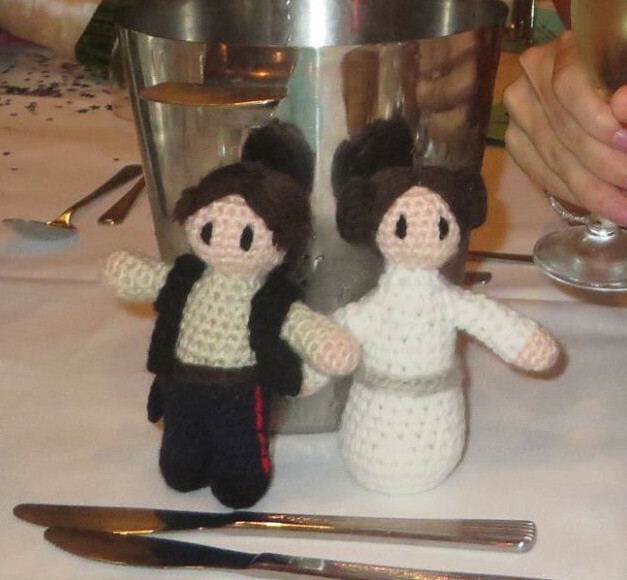 While we’re on the topic of Star Wars dolls, this is as good a time as any to post pictures of the Han and Leia dolls I made for my friend Nic last year. 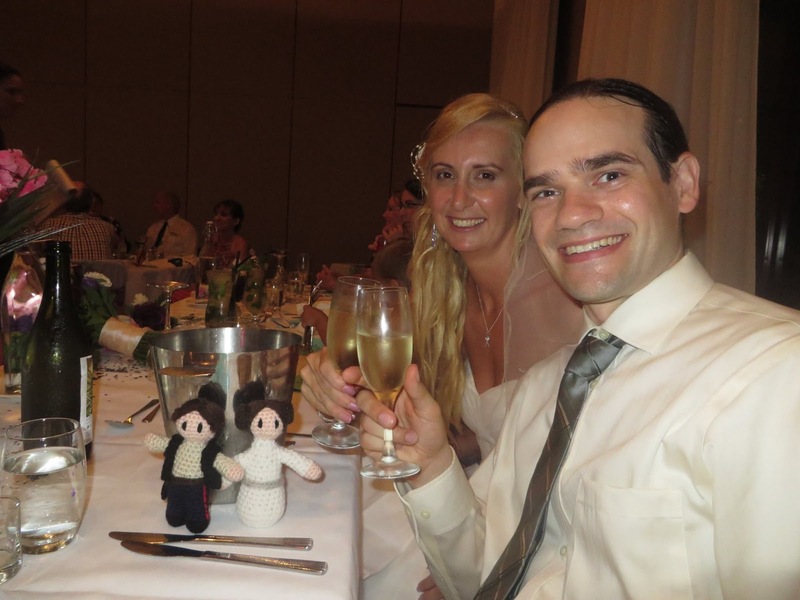 She got married in Australia in February, and she’s a huge lifelong Star Wars fan. They had Han and Leia cake toppers, too! So of course I had to make her dolls to include in the reception. And that’s it for now! I hope everyone had a great holiday break, and Happy New Year to all!